A basic, yet effective cleansing of the skin that will leave it feeling smooth and refreshed. Our licensed estetician will provide a thorough skin analysis to determine your skin type and decide which products will be used. Next, steam and a light exfoliation with pore extraction (if needed) will be provided. 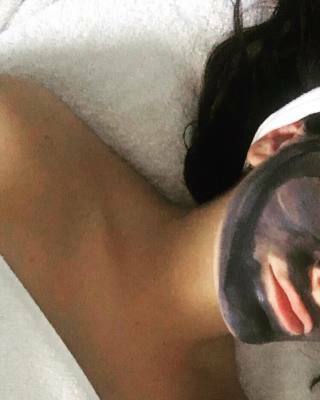 Then a facial massage and mask will relax you. After that, the skin will return to its normal pH by having a toner applied and finally a moisturizer to end the treatment. Microdermabrasion: This machine that provides a deep exfoliation with a diamond tipped wand with suction. Great for all skin types except sensitive. Helps hyperpigmentation, acne/scarring, dry/dull skin and overall just wonderful treatment for smooth, healthy skin. Stand Alone: $80. Add On: $40. ​Dermaplane: This treatment is also an exfoliation process provided manually by a scalpel. Our licensed esthetician is certified with Dermaplane Pro, so please don't worry about the scalpel. This removes the layer of dead skin along with the vellus (Peach fuzz) hair on your face. It is NOT shaving and will NOT make your hair grow back thicker/darker. This is a myth. Stand Alone: $80. Add On: $40. Designed for someone who needs a deeper cleansing due to clogged pores or someone who is experiencing troublesome acne. If you maintain the prescribed at home regimen along with monthly facials, should expect to see an improvement in the appearance of your skin within 3 visits. This facial has all the basic facial features, but with a focus on deep cleansing. Salicylic Acid 7% or 15%: For acne or oily skin types. Helps eliminate bacteria in the pores as well exfoliate the skin. With regular use, will help even the most severe acne. Glycolic Acid 40%: For dull skin that needs a little pick me up. Helps with fine lines or those concerned with anti-aging. Lactic Acid 10%: For all skin types, even sensitive, as this is the mildest peel there is. Helps brighten and lighten the skin. Contains dairy, please note if there is a sensitivity prior to treatment. Lashes and Eyebrows: Lash lifts are essentially a lash perm. We choose a rod that is appropriate for your lash length and lift the lash so you can no longer need to use that pesky lash curler. Add on a lash tint and eliminate the need for mascara. Eyebrows can also be tinted for the illusion of a fuller brow. Last about 4-6 weeks! ​ For the experienced skin care client. This treatment includes either microdermabrasion or dermaplane with a peel. By using two forms of exfoliation, we can essentially create an instant gradtification look. Brightening and creating a glow of the skin. Please note, if you have never had a peel before, a patch test is required to see how the skin reacts. If you can not handle the peel, we can still provide the facial with the microdermabrasion or dermaplane.